The S. Rae Hickok Professional Athlete of the Year award, known as the Hickok Belt, was a trophy awarded for 27 years to the top professional athlete of the year in the United States. It was created in honor of Stephen Rae Hickok, the founder of the Hickok Manufacturing Company of Rochester, New York, which made belts, hence the choice of a belt as a trophy. The trophy was an alligator-skin belt with a solid gold buckle, an encrusted 4 carat (800 mg) diamond, and 26 gem chips. It was valued at over $10,000 in the currency of the time, and its presentation was a major event in sporting news of the day. For the first 21 years, from 1950 to 1970, it was awarded in Rochester at the annual Rochester Press-Radio Club dinner (an event that continues today). After the Hickok company was taken over by the Tandy Corporation, the award was presented in larger cities such as Chicago or New York. The last award was made in 1976. In 2010, Tony Liccione, the president of the Rochester Boxing Hall of Fame, announced plans to reinstate the Hickok Belt starting in 2012. The mold used for the belt starting in 1951 (the 1950 belt spelled Mr. Hickok's name as "Ray") has been found and will likely be used again. Liccione plans to invite the 18 surviving belt winners (except O.J. Simpson, who is incarcerated in Nevada) to a banquet in September 2011, followed by the first new presentation of the belt in 2012. Starting in 2012, the belt has been awarded based on a vote by the National Sportscasters and Sportswriters Association. A 20-member panel chooses one athlete each month, with the twelve monthly winners eligible for the belt award at the end of the calendar year. Three belts have now been awarded since 2012, two to Lebron James. 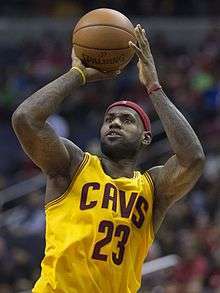 LeBron James - a two-time Hickok Belt winner since the award's revival. ↑ Morrell, Alan (October 23, 2016). "Whatever Happened To ... the Hickok Belt". Democrat and Chronicle. Rochester, New York: Gannet Company. pp. 8A–9A. Archived from the original on October 24, 2016. Retrieved October 24, 2016. ↑ "Hickok Award to Yankee Star". The Windsor Daily Star. Associated Press. January 22, 1957. p. 18. Retrieved October 18, 2011. ↑ Matthews, Bob (October 12, 2010). "Hickok Belt is returning to Rochester". Democrat and Chronicle. Rochester, New York. Gannett Company. pp. 1A,4A. Archived from the original on October 14, 2010. Retrieved October 14, 2010. 1 2 3 Bradley, Steve (October 13, 2010). "Hickok Belt mold to be used again". Democrat and Chronicle. Rochester, New York. Gannett Company. pp. 1D,2D. Archived from the original on October 14, 2010. Retrieved October 14, 2010. 1 2 Adams, Thomas (September 19, 2011). "Efforts underway to bring back the Hickok Belt". Rochester Business Journal. Rochester, New York. Archived from the original on September 19, 2011. Retrieved September 19, 2011. Pitoniak, Scott (2010). Jewel of the Sports World: The Story of the Hickok Belt.